The Funky Felter: Three and a half months and counting! Three and a half months and counting! My precious baby Rowynn is now three and a half months old and acting like such a big girl. 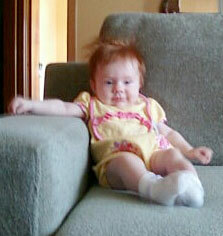 Here she is sitting on the couch. This proud mommy just had to share the photo with you! P.S. I apologize for not posting a special in my Etsy shop this week. I had to go out of town for an unexpected family obligation, but I am back now and will begin posting specials again next week. Awww such a big girl, mommy must be so proud!! She is so gorgeous -- I love the pose!